The notion that overweight people just need to eat less and/or do more is just another way of saying that overweight people are greedy and/or lazy – they eat too much and/or do too little. I do not subscribe to this view. We have assumed one direction of causation and not considered the other. We assume that being lazy has made people overweight – we don’t take into account that larger people are simply less able to move around. They are caught in a vicious circle and patronising assumptions are doing nothing to help or solve the problem. 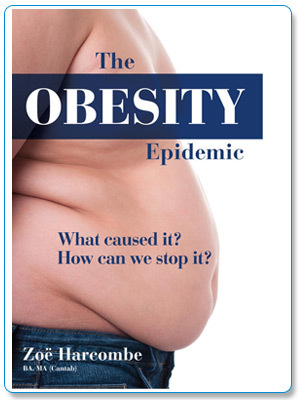 Chapter 3 goes into two other clear causes of obesity – neither of which are about eating too much or doing too little. We look at the hormone system in the human body and briefly note in how many different ways this can make humans gain weight. Children gain weight in puberty (growth hormones); women gain weight during the monthly cycle (progesterone, oestrogen – a cocktail of different hormones); men and women can gain weight during the menopause. We note the impact that thyroid can have on weight and, the most fattening hormone of all, insulin. The second and quite scary area that we explore is the mass of prescription medication that is being given out and consumed by people in the ‘developed world’. From hormones being taken as tablets, to medication for depression and psychological illness – there are drugs being ingested that can cause as much as a 10 kilogram weight gain in a year. The chapter strongly recommends that doctors prescribe more cautiously and patients accept prescriptions with far greater challenge and that both doctors and patients discuss likely weight gain before starting a course of ‘treatment’. The conditions are named in this chapter, the drugs and brands are named and you will be able to see if you are taking anything that is the real culprit for your weight gain. You may not be greedy, or weak-willed; you may be suffering avoidable side effects of something you would be better off not taking.